Pfc. 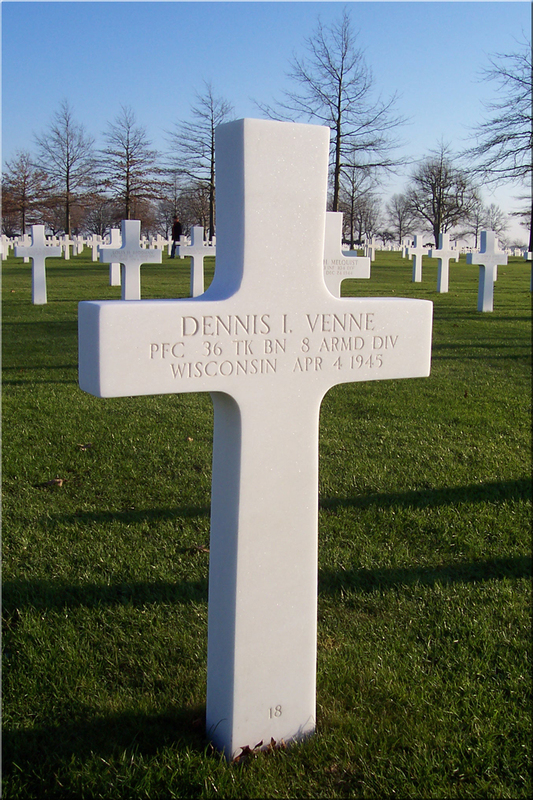 Dennis Ivan Venne was born and raised in Tomahawk, Wisconsin. 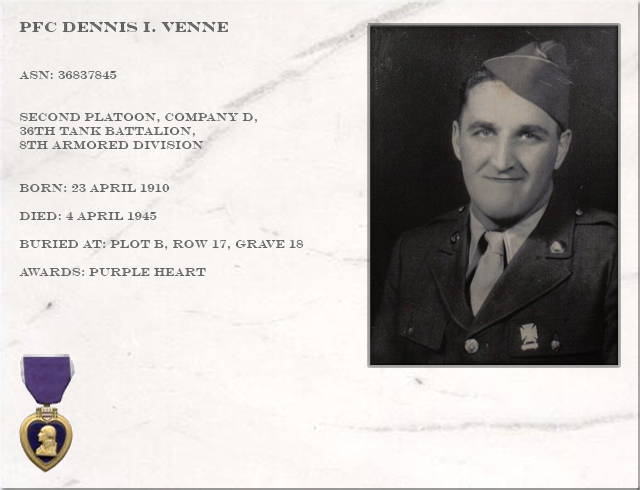 Dennis was one of the eight children of the Venne family. As a young child, Dennis did not particularly like school, so he developed a certain creativity in finding ways of getting out early. His sister characterised this creativity quite eloquently with the words : he disliked school with a passion. Later Dennis worked on several farms in Tomahawk, but work was scarce and did not pay much. Eventually, in 1942 he decided to try his luck at a factory in Milwaukee. When war was evident, Dennis was eager to enlist, but he was rejected for physical reasons, including poor eyesight. When in 1944 more men were needed for the war effort, he was accepted for service. 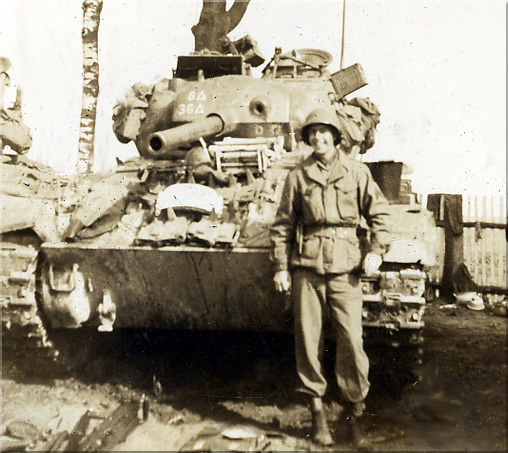 He served as a member with the 8th Armored Division, 36th Tank Battalion, D-Company, as a tank crewmember. On april 1, 1942 the 8th Armored Division was activated in Fort Knox, KY. The Division was a training division to provide complete cadres, officers and enlisted men, for new armored divisions (numbering up from the 9th AD to the 20th). 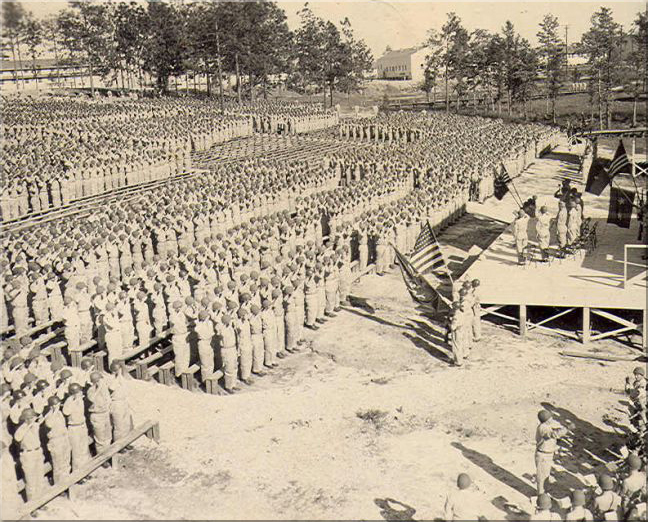 In February 1943 the 8th AD, already transformed in to a "light" division, was redesignated as a combat division. In March the division moved to North Camp Polk, LA where they took over the vehicles and other equipment from the leaving 7th Armored Division. After many excersises, bivouacks and stop-overs, the division departed for the ETO in November 1944. On January 5, 1945 they landed in Le Havre / Rouen, France. After being assigned to the 9th Army they marched through the Netherlands, the German Ruhr-area and over the Rhine. Often they met fierce enemy opposition. After VE-day the division went to Czechoslovakia for occupation duties. On September 19, 1945 the division returned to the US and on November 13, 1945 the division was de-activated in Camp Patrick Henry, VA.
D-Company, as the battalion’s light tank company, was one of the very few to be solely equipped with the M24 'Chaffee' light tank, which was introduced to the ETO in January 1945. The first batch of 200 M24 tanks (December 1944) did go to the First and Ninth Army. These M24s were not replacements for the M5A1 Stuart tank but arrived with the four last armored divisions to be deployed in the ETO, the 8th, 13th, 16th and 20th Armored Divisions. At 0800 h, 2 February 1945, Company D began their 250 mile motor march to Margraten, the Netherlands. 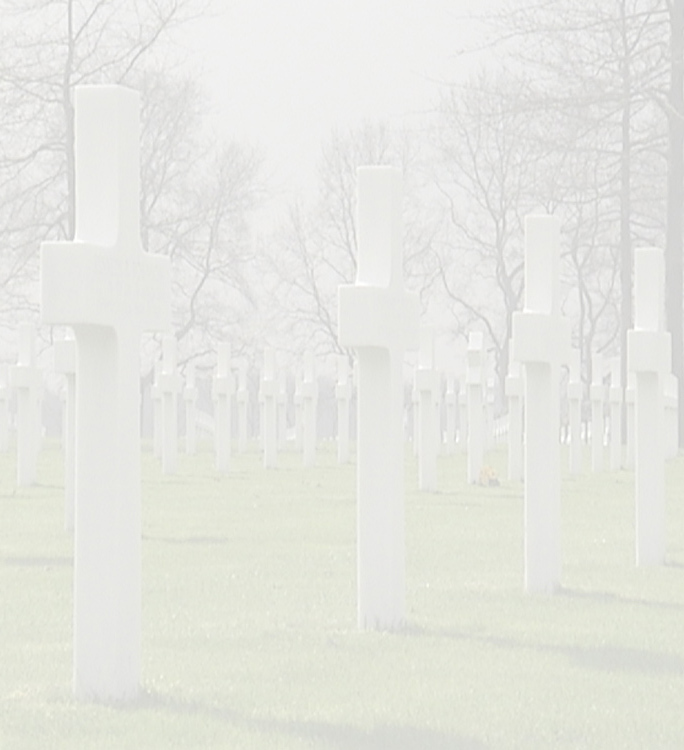 Margraten was at that time the site of the 9th Army American Military Cemetery, which is now known as the Netherlands American Cemetery and Memorial. On 21 February they moved out from Margraten to Posterholt near Roermond. There they replaced the Durham Light Infantry of the British Seventh Armored Division (the Desert Rats). 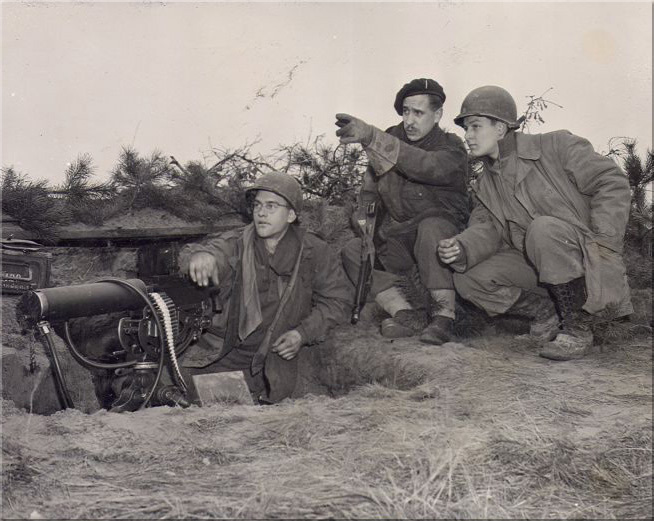 Posterholt proved to be a quiet, defensive sector where they practiced indirect fire on the opposing enemy positions in Vlodrop and sent out several successful night patrols. Aside from an occasional shelling from enemy mortars and artillery, and even though the Germans were only several hundred yards away, their stay in Posterholt was relatively quiet. Receiving orders to move to an attack position in the vicinity of Wachtendonk, Germany, the battalion along with its attachments, now officially known as Task Force Van Houten, departed from it’s position southeast of Wildenrath early in the morning of 2 March and proceeded toward Wachtendonk with the mission of relieving a similar task force of Combat Command A of the 8th AD. The blood-red clouds in the sky that greeted the sun on the morning of Monday 5 March 1945 were a forecast of the shedding of the blood of men of the Thirty-Sixth who were to die that day on German soil. The tankers were to meet an overwhelming force, yet in spite of great odds they were to emerge victorious from the ordeal. On the morning of the 5th, the 36th Tank Battalion, as a part of Combat Command B, were attached to the 35th Infantry Division with the mission of moving forward, seizing Lintfort and Rheinberg and then, if ordered, to seize the bridge across the Rhine at Wesel. Their G-2 information was that there was only minor opposition to be expected; that there were only three self-propelled weapons, one anti-tank gun, no tanks and about 300 disorganized and demoralized soldiers on this side of the Rhine. That information, they were to learn soon, was "all wet." D-Company, the M24 light tank company of the 36th, commanded by Captain Arthur C. "Ace" Erdmann, moved over Kamperbruck to an attack position southeast of Alterspan Wood. The M24 tanks moved with no prior reconnaissance, and had no idea of what was ahead. Enemy guns engaged the company but were speedily knocked out. Receiving fire from anti-tank guns, small arms, mortars and artillery, the company nevertheless moved forward and after the third assault, three tanks, later knocked out, entered Rheinberg. The attack was costly both in tanks and men. Captain Erdmann lost a foot as the result of stepping on a mine and platoon leaders, 3rd Platoon Lt. Frank Rich and 1st Platoon Lt. Kenneth Robinson died heroes' deaths as they led their men forward. Dennis's tank took a direct hit. 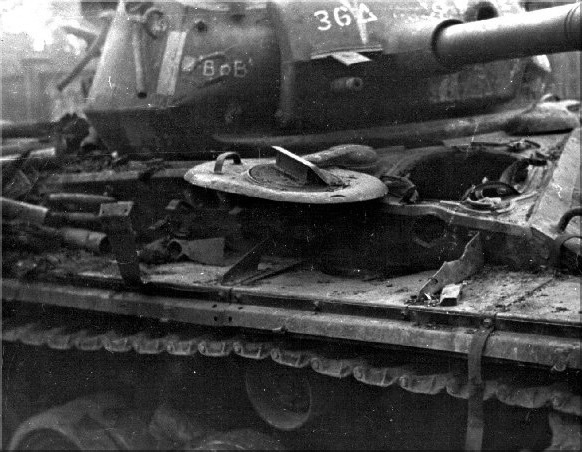 When dismounting their tank, the crew was hit by shrapnel. Dennis was severely wounded in his back. 2nd Platoon leader Lieutenant Ryan, who later wrote a letter to the family of Dennis, lost his right arm in one of the blasts. Dennis and the Lieutenant were captured and brought to the St. Joseph hospital in Apeldoorn, The Netherlands. Here Dennis died of his wounds on April 4, 1945. He was temporarily buried at the Heidehof cemetery in Ugchelen. On February 4, 1946 he was re-buried at the American cemetery at Margraten. The family was told that Dennis was injured but were not informed about Dennis' death until more than 2 months later, after the war already had ended. His sister, Mrs. Bielinski, youngest of the 8 children, tells that when they went to Dennis' house in Milwaukee to tell the landlady about Dennis' death, she surprised them by saying she and Dennis intended to get married. This was typical for the reserved and quiet Dennis. Mrs. Bielinski thinks frequently about Dennis, "if there was ever anywhere I'd want to go, it would be there to see my brothers grave". She paid him the ultimate tribute by naming one of her nine children after him, using both the first and middle names: Dennis Ivan. Mr. Robert Duijkers, webmaster of Field of Stories, where the story of Pfc. 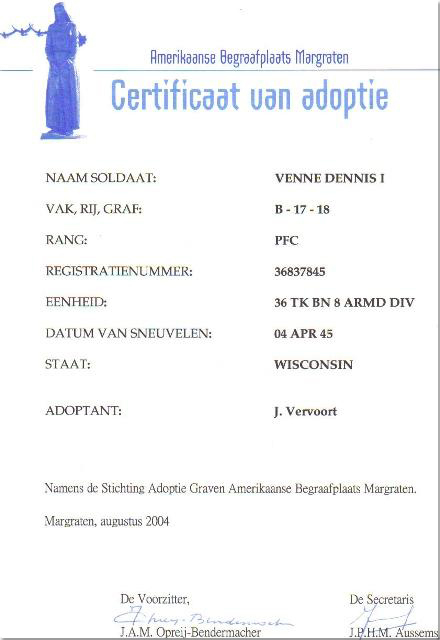 Dennis I. Venne was originally posted.